The video is a step-by-step guide on how to use a Bissell Carpet Cleaner at home. The first part is about preparing the Bissell Carpet Cleaner by putting water in the Clean Water pouch. This highlighted Bissell’s tank-and-tank system, wherein the clean and dirty water is stored separately in one tank. A heavy-duty pouch holds the clean water, while the dirty water is stored outside the pouch, making the storing and disposal of water easier. The Formula Tank is where Bissell’s Advanced Cleaning Formula is mixed with water. To get started, simply set the Custom Clean dial to the desired setting, and the Ready Tools dial to Floor Cleaning. The second part of the video is about cleaning carpets with a Bissell carpet cleaner. Simply hold the trigger down to make a wet pass over an area of the carpet, and release the trigger to make a dry pass and let Bissell cleaning machine do all the cleaning. The Bissell Pro Heat 2X’s secret is the powerful combination of Dual-Rotating brushes and its strong suction power. The Dual-Rotating brushes loosen the dirt, soil and grime on the carpet, and the strong suction power lifts it all off. The Bissell Carpet Cleaner can also be used in cleaning hard-to-reach areas with the various tools that comes with it. Just attach the desired tool to the end of the hose and turn the Ready Tools dial to Tools. The video demonstrated how to use the Bissell Carpet Cleaner in a very simple way, making it easier for owners and potential buyers to understand. 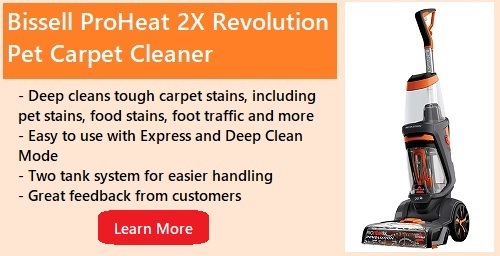 This will help owners and potential buyers to make use of their Bissell carpet cleaners to its fullest without any worries. The video also showed the different technologies that make the Bissell carpet cleaner distinct and stand out from other carpet cleaners.